Interested in Growing Sweet Potatoes? For folks in the South, growing sweet potatoes is tradition. The plants thrive in hot, humid weather and they grow well in different soil conditions. Sweet potatoes are grown from sprouts that emerge from a sweet potato that you would buy in a grocery store. These sprouts are called slips. To get slips, you can purchase them from a seed catalog or garden center. You can also grow your own slips by purchasing an organic sweet potato from the grocery store. This should usually be done in mid-January to allow enough time to develop the slips before planting time. Leave the sweet potato in a warm spot in your pantry. Once it begins to sprout, submerge the unsprouted end in a jar of water. When you are ready to plant the slips in your garden, pull them off the potato by hand. Remember which end of the sprout was attached to the potato as this is the end of the sprout that will be inserted into the soil. Each sweet potato will produce 6-8 slips, sometimes more. Each slip will produce 4-10 pounds of sweet potatoes, depending on the growing conditions. 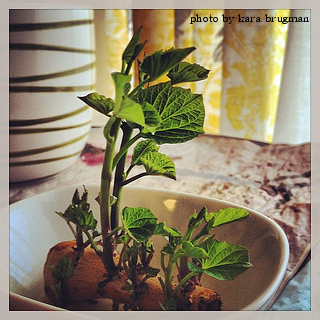 When growing sweet potatoes, plant them in the garden when the soil warms to at least 70 degrees F in the spring. They require at least 6-8 hours of direct sunlight everyday, but more is better. The tops of the plants spread out as vines and they need plenty of space to grow. They typically take 90-110 days to mature and are harvested before the first hard frost in the fall. 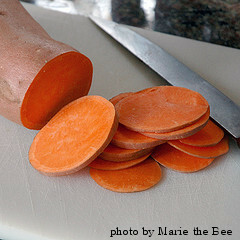 After harvesting, sweet potatoes need to be cured for 7-10 to sweeten them up and toughen the skin so they store longer. Sweet potatoes can be stored for several months in a cool, dark location if they've been cured properly. Sweet potatoes can be used in a variety of dishes and recipes. They can be baked, fried, steamed, boiled or roasted. 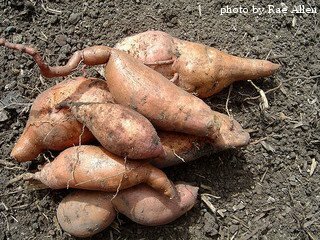 Click on the following links for more information about growing sweet potatoes. Questions About Growing Sweet Potatoes?